Every once in a while, I look back at some of the stuff in my collection to make sure I didn't miss anything good or interesting. I'm glad I did. I had written off Super Deck! as one of those awful "me too" CCGs. And, in some ways, it is. But in just as many ways... it isn't. First, it was produced in 1994. Even MTG didn't hit the market until 1993, so that puts Super Deck! as one of the earliest. With MTG being the only CCG released in 1993, Super Deck! was only 1 of the 9 produced in 1994 (along with SJG's Illuminati: New World Order. )* 1995 saw 42 releases, with subsequent years averaging about a dozen. Second, it was designed by Marc Miller. Yes! Traveller Marc Miller. Now, to answer the question, "Is there anything special about the design?" Well, I'm not a CCG guy so somebody else will have to hit me about this, but... aren't they kind of all the same anyway? Really, aren't games like this about weird power cards and killer artwork rather than the system mechanics? Neither Super Deck! 's art nor the powers/concepts are nearly as tongue-in-cheek as Stuper Powers!, though they're trying to be. So when you put that case together, Super Deck! the game seems like an obvious attempt to quickly get a super hero CCG to market before anyone else. What I just said about the art aside, that brings us to my third point... the deck features art by several artist who would go on to become fairly noteworthy. First, Eisner Award winner Brian Michael Bendis, who wouldn't really start to make waves in the comics world until 5 or 6 years after this game came out. Second, Emmy award winner Dean Haspiel who, among other endeavors, collaborated with Harvey Pekar on some of the American Splendor series. Third, Green Arrow artist Phil Hester. And finally, Frances Mao and alt comic artist Josh Neufeld. When dealing with vintage items, the inevitable questions arise: 1) "Is it worth anything?" and 2) "Is it worth buying?" As for the answer to question 1, take a look at this item on eBay and you tell me. (To save you some time, "No. Not really.") As for question #2, if you collect CCGs or are trying to design a CCG, then sure. Why not? If you collect comics (particularly Utlimate Spider Man, Daredevil, Green Arrow, American Splendor, or Sonic the Hedgehog), then sure. Why not? If you're a collector of World Trade Center/Twin Towers memorabilia (and I don't mean Tolkien's Two Towers), then sure. Why not? 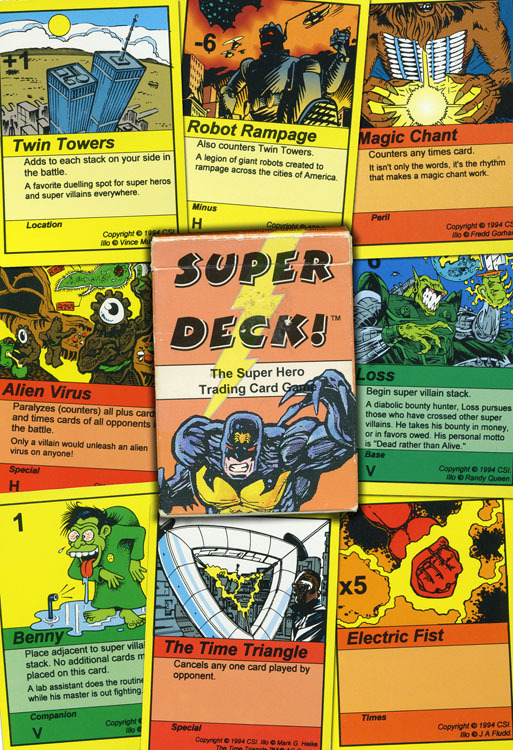 (Take a look at both the "Twin Towers" and "Robot Rampage" cards in the image above.) If you're looking for a CCG that only has 160 total cards available with very little chance of ever seeing any expansion packs so you don't get addicted to keep putting $$$ in the pockets of WotC, then sure. Why not? If you're looking for a fun, battle-style card game, check out some of these invented card games using standard playing cards. * All statistics including release dates per Wikipedia. Loved Russ's stuff in the Fiend Folio, but really started digging his work when I read the book Dicing With Dragons and the Fighting Fantasy game books. If there's one artist who typifies old-school art to me, it's E.O. To this day, the AD&D Monster Cards are one of my favorite items in my RPG collection. And just in time for Christmas, the old-school game box adorned with Erol Otus art. The reason I started playing V&V was because of all those great little ads in Dragon feature J.D. 's art and characters stats. It's an atrocity that TSR threw most of Dee's early D&D work in the trash. But if you're interested, Jeff has already more than doubled his kickstarter goal of $2,500 to recreate the Egyptian Art from Deities & Demigods. And he's got 9 days left to go! Billman's another one you might not know as well. He was the guy behind most of the Lords of Creation art from Avalon Hill. Like James over at Grognardia, I regret never playing the game. Billman still does illustration, but in a more commercial/popular children's vein, but also has a full time in-house graphic design gig. NOTE: I had a really hard time deciding which piece of art to showcase at the top of this page. Out of respect for all of the folks mentioned in this post, this is my first blog post (since I started the page) with no graphic at all. Just had an awesome day of playtesting the combat system for Starmasters with my co-conspirator David Welborn. We've officially traded in the old wargame style action sequencing (i.e., 1. All Move, 2. All Ranged Attacks, 3. All HTH Attacks, 4. Non-attack Actions) for a new phased system that really supports the fast-paced style of the sci-fi action. However, the core action mechanics ("to hit" rolls, combat modifiers, damage, etc.) haven't changed, just the way movement and actions are handled within "close-action time." 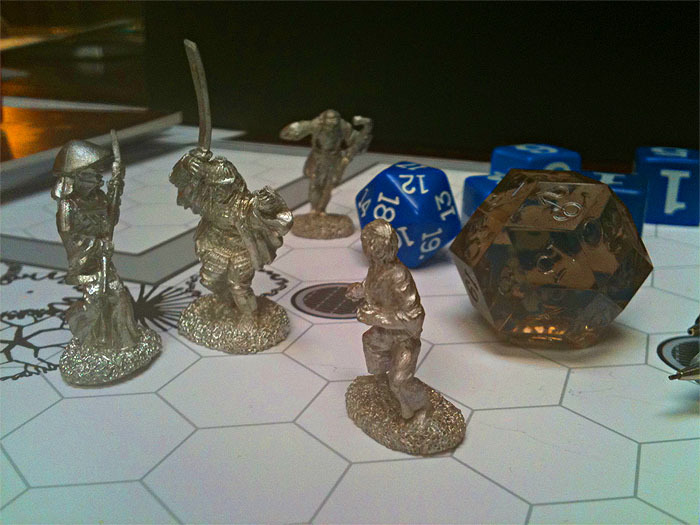 We play-tested some some 5-man free-for-all combat situations (with each character being one of the 5 primary races from the game) and, so far, it plays really smoothly and seems really balanced (even when some of the characters entered combat with archaic blade weapons). Each situation played rather quickly (if you don't include the stop/starts for game theory discussions of the actual rules, etc.) and resolved itself within about 30 seconds of game time (but if everybody has a blaster, and the blasters are deadly, that should be the case.) BTW, I know I just mentioned this, but I'll say it again... combat is VERY deadly, so bring plenty of Redshirts with you. Another pleasant surpise is how well the adaptations from my recent d30 Feature postings have worked out considering Starmasters uses only d6s and a d20. 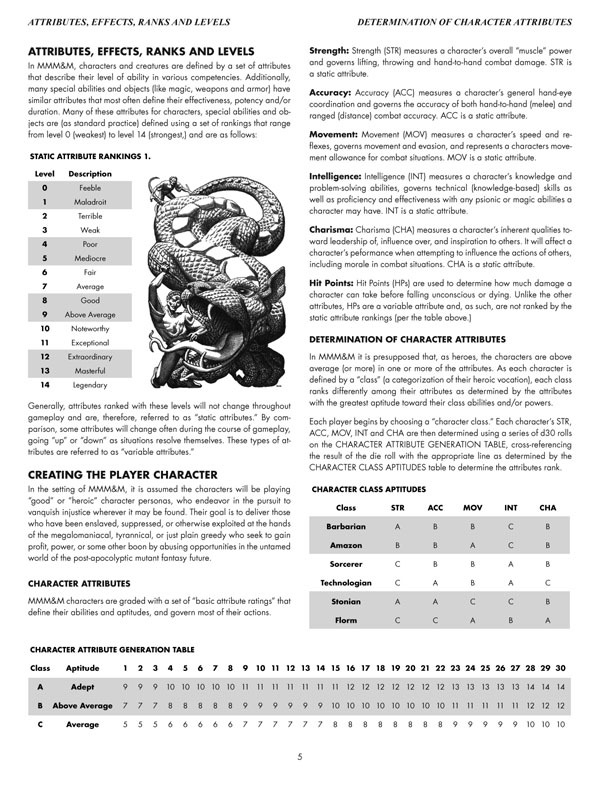 These adaptations include a damage determination system similar to the d6 Result by Rank chart, and slot-based attribute generation which REALLY worked out well, producing balanced characters with attribute strengths and weaknesses appropriate for their race in the context of a "roll for your stats" mechanic. The real "game changer" moment of the day came from the way that careful aim (in lieu of making any movement) worked. It was deadly when it should have been deadly, but reasonably forgiving in the context of a fast-action situation. I know Friday is normally by d30 Mechanic of the Week day, but somehow I feel still like this still counts. After all, we wouldn't have made some of the leaps in the system mechanics that we did had it not been from my recent d30 obsession. I'm Thankful For... FREE RPGs! 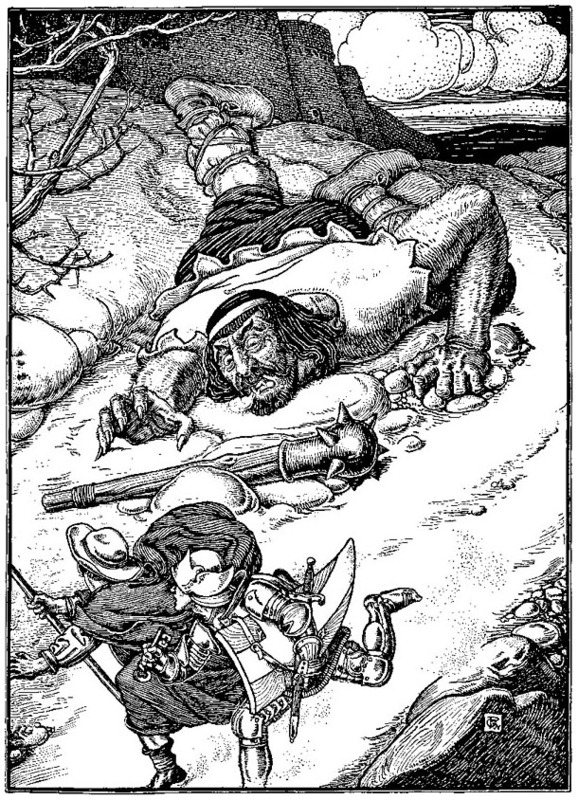 Pictured at left, a Louis Rhead illustration from the 1916 edition of John Bunyun's Pilgrim's Progress. Among all of the things that I'm truly thankful for this Thanksgiving (including my beautiful nerd-loving wife, our 2 dogs, our families, our collective health, the other blessings God has bestowed upon us), I'm thankful for the bountiful cornucopia of free RPGs available via the interweb (which, BTW, includes The System, and will hopefully at some point also include The System: Expanded.) I'm also thankful to the people who host them, tend them and/or cultivate their interest! The man in the kitchen behind 1KM1KT is its benefactor (and Web developer/host/creator) Keeton Harrington, while the face at the front counter (and all over the forums) is Rob Lang. A lot of the free RPGs at 1KM1KT are entries from the contests they sponsor, but not all of them. Even the contest entries are pretty freakin' amazing considering many of them were written and laid out in 24 hours. Granted, many are rules light, but that doesn't keep them from being truly inspired and impressive. Eric "Chris" Garrison adds the RPGs as he finds/is emailed about them, so the organization is a simple "newest on top" comprehensive list. It's not searchable (other than the "find" command on your browser) or organized by any other means, but it's fun to stroll through. The order never changes (newest adds first) so remember where you leave off and you can pick back up there the next time. My recent minotaur illustration and my chance meeting on the same day (yesterday) with a $2.99 copy of The Lost Caverns of Tsojcanth at Half Price Books got me thinking... is the minotaur's maze the most overused cliché of the dungeon crawl? While it can be argued that in some way most dungeon crawls are actually labyrinths, I'm referring specifically to maze-like designs that feature an actual minotaur (or minotaurs) in them. Finally... an entire module devoted to a maze and a minotaur! 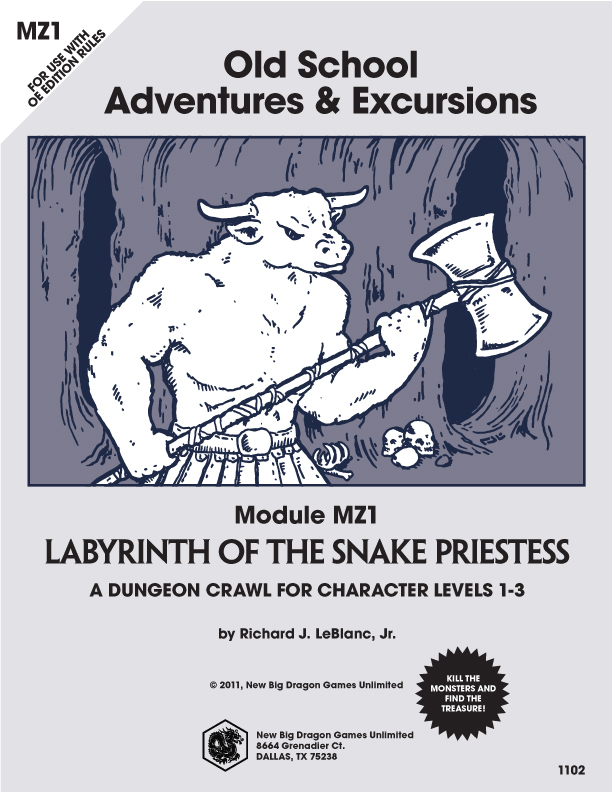 This solo module by Jeff Grubb invited players to "Explore the Maze of the Riddling Minotaur in an invisible ink module that you can play by yourself or with a group of adventurers!" Utilizing a seemingly incomplete map and an invisible "A,B,C" choose-your-own-adventure style mechanic, a special pen revealed pre-printed invisible ink to produce the results of encounters as the character(s) worked through a classic "rescue the princess" plotline. 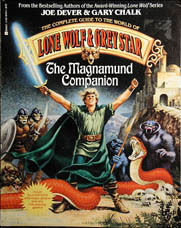 Designed for use with Moldvay B/X, the module contained "two" versions of the adventure, 1 for solo play, and an "expanded" version, that essentially just adds wandering monsters to the same maze, as well as a few brief encounters outside of the main solo adventure location for a group storyline. So let's recap: Over the course of 3 or so years (technically 7 if you include the pre-published/tournie dates), that's 4 TSR modules (out of about two dozen published those same years) that prominently feature mazes and minotaurs (+1 with a maze and an ogre), and 4 of those 5 are in the top 22 adventures of all time. Well, I think we can say for sure that it is a cliché, but the "most overused one?" Honestly, D&D is wracked with clichés (see the name of the actual game for two of them.) The entire game is founded on clichés (heroes, magic, et al.) 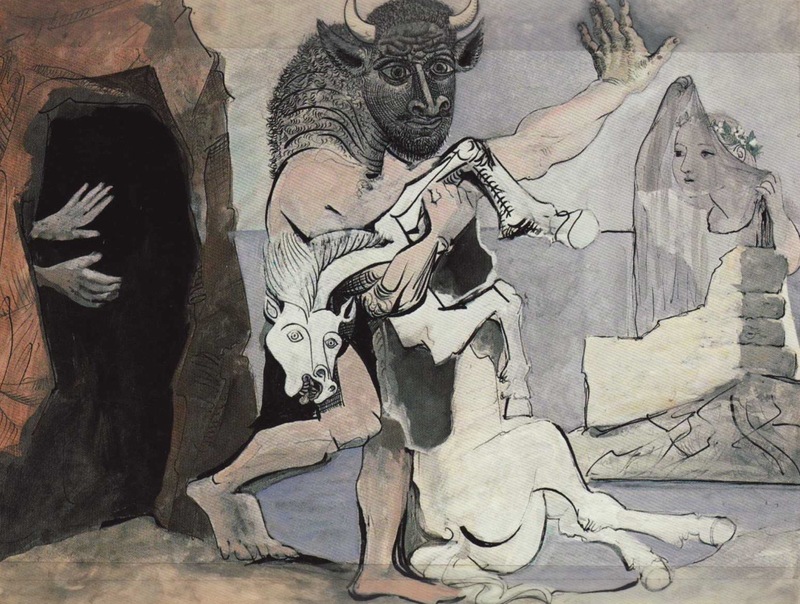 But if you're okay with that, so am I.
Pictured at top: Minotaur and Dead Mare before a Cave Facing a Girl in a Veil, Pablo Picasso. I was watching the Minotaur episode of Clash of the Gods on the History Channel and was inspired to do a Minotaur drawing for this week's Illustration of the Week. I also decided to throw it into a mock cover layout for a module inspired by the same episode. May or may not ever get around to writing it, though. 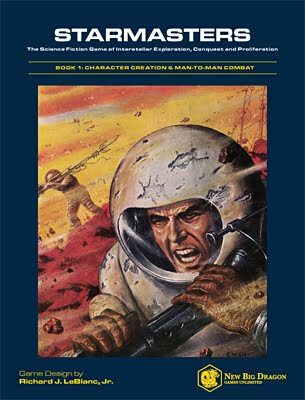 And check out the starbust on the cover; it says simply, "Kill the monsters and find the treasure!" It doesn't get any more old-school than that. This is something I've actually been wondering for a while, but was prompted by a question from my co-conspirator David Welborn to investigate. The Royal Game of Ur (a.k.a. "Game of Twenty Squares") is a board game that dates to the First Dynasty of Ur in Mesopotamia, and is quite possibly the oldest board game equipment ever found. It appears to be a race game of some sort, played with two sets (one black, one white), seven markers and three tetrahedral dice. (That's a d4 to you and me.) It is believed to be a precursor to the game backgammon. What follows are some of the earliest recorded (available) U.S. patents for the various polyhedrals. In most cases, the standard, numbered forms we're familiar with don't seem to be patented (as they were probably too common/widespread as a whole) to merit a patent. Issued March 13, 1900 to V. Mapes as simply "dice." This is actually a patent for "Poker Dice" with various suits and numbers/face initials interspersed over five total dice in the game. U.S. Patent# 1,030,554: "Skeletal d4"
Issued June 25, 1912 to S.E. Wharton for "a game." This version is more of a skeletal drawing of the inside, than the flat-faced version we've come to know. Issued April 24, 1917 to E.N. Breitung as simply a "die." This is a slightly more "rhomboid"(?) version of the standard d8, featuring a combination of 4 triangles and 4 "kite" shapes, with pips instead of Arabic numerals. Issued Sept. 29, 1925 to H. Bernstein as a "gaming device." This is pretty much the d20 we've come to know and love, but featuring the letters M(x5), A(x4), K(x4), E(x3), J(x2) and the words "Honest Abe" on the other 2 faces. 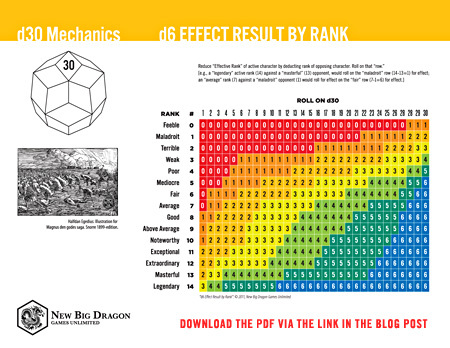 Some sources will generically state that the early 1950s sees the blooming of the wargames industry, and their adoption of the various types of dice. Part of that seems to be true... the blooming of the industry. Historically, many wargames featured either simultaneous hidden movement or responsive movement, and often didn't use dice at all. In H.G. Wells's Little Wars (1913), the only mention of dice is for determining size of armies, and casualties are determined by player agreement. Even Kriegspiel, a German wargame originally created in 1813 for training of officers during the Prussian War, only used dice for "friction" factors outside the hands of the officers, including morale, meteorology, the fog of war, etc. The majority of the most popular early wargames (published by Avalon Hill, SPI, etc.) seem to mostly use d6s, when they use dice at all. The 1977 Holmes Basic boxed set came with a d20 numbered 1-10 twice and included no d10 proper. Through the use of a second determiner die (or crayon coloration), the d20 generated a result of 1-20, or doubled up generated a result of 1-100. It wasn't until the introduction of Moldvay Basic in 1981 that the box included a true d10. in 1982, sold the idea to toy and game entrepreneur Roy Lippman of Baltimore, Maryland, USA. For those who don't know, Lippman's company was The Armory, the great rival to Lou Zocchi's Gamescience. 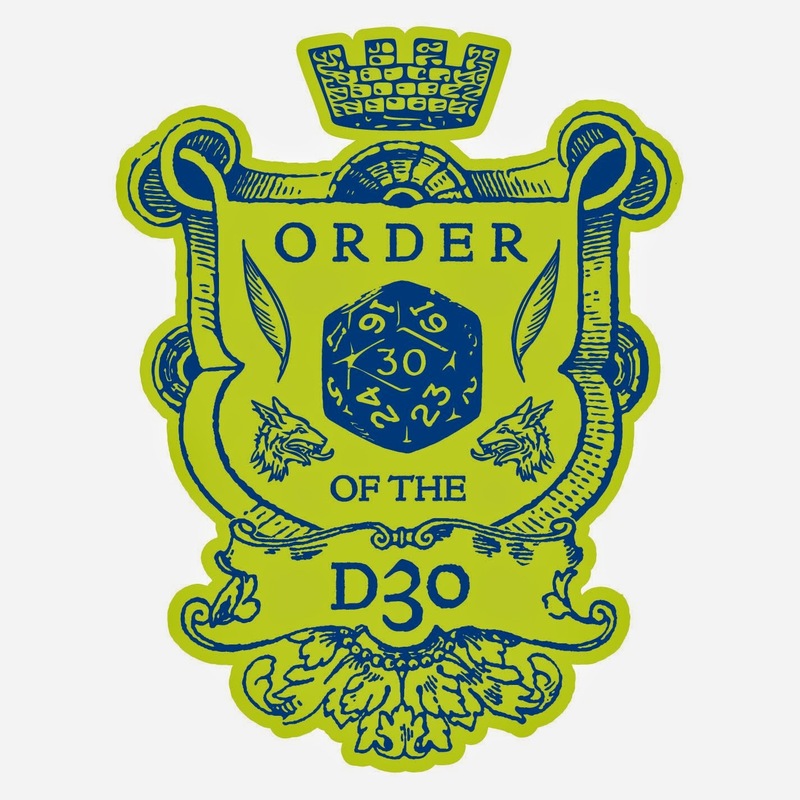 As a distributor and publisher, the Armory really got behind the d30 and put out several publications, mostly to give gamers a reason to buy a d30. Honestly, there are some other stories behind dice like the d5, the d34, and crystal dice, but for the sake of this discussion, I don't find them that important, or interesting honestly. 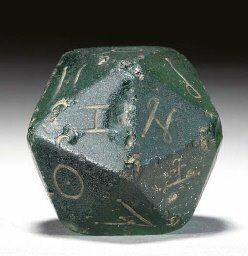 Over at dicecollector.com, there's a nice gallery of old dice that shows some nice images of many older dice that have been discovered. *Joke contributed by David Welborn for all you Gamescience fans. 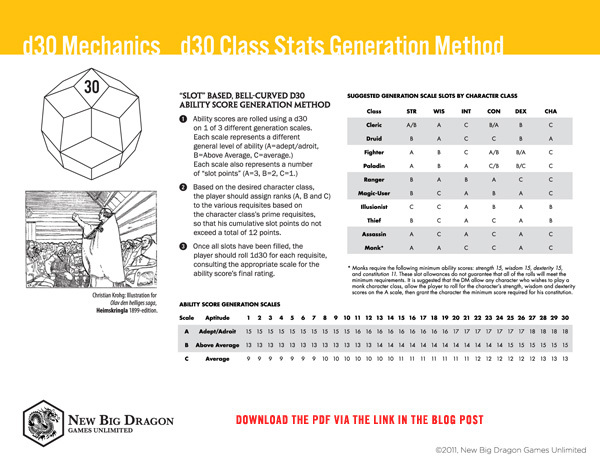 This week's d30 Feature is a d30-based method for generating D&D character class ability scores. It's based on my class attribute score generation method from Magic, Man, Mutants & Machines, the d30-based RPG I've been working on. I'll admit, this is a tad unbalanced as it tends to generate attribute scores of average and above, but should be comparable to methods like "roll multiple times for each and keeping the highest score for each," and the like. More importantly it bypasses the extraneous dice rolling in those methods. 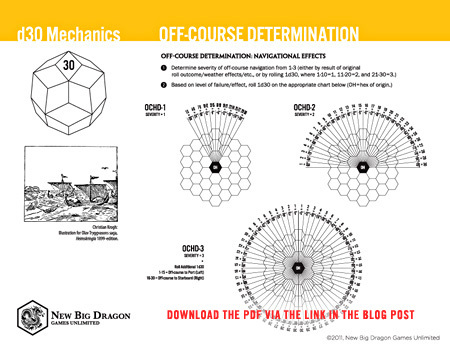 To download a free PDF of today's chart/mechanic from MediaFire, click here. As a graphic designer and a teacher of graphic design history, I've been familiar with William Morris (no, not the Hollywood agent) for quite some time, but only recently discovered his connection to the roots of the original fantasy game. What follows is a brief timeline of documented connections that links the Industrial Revolution to the birth of RPGs. Due in great part to the development of steam power (fueled primarily by coal), many jobs that were previously performed by manual labor become mechanized. And, as it seems to go in "industrialized" nations, the continuing goal is to get costs (and prices) lower and lower. The long and short of the Industrial Revolution... speed goes up, costs go down, and quality gets thrown out the window. (There's a saying in the business world, "Good, fast and cheap. Pick two.") Like many other products, book design becomes a casualty in the growing world of mass production. Present at the lecture was William Morris who, though interested in printing for quite some time, was inspired both by the lecture (focusing on a return to the quality and dedication to the craft of pre-Industrial Revolution printing) and Walker's collection of 16th century typefaces (from the masters at the birth of the printing industry as a whole.) This evening became the catalyst for Morris's founding of the Kelmscott Press. More important (for this discussion anyway) than Morris's contributions to book and typography design (like the typeface Chaucer), was the subject matter of the books Morris published, some of which were written by Morris himself. In this context, the most important of them is The Story of the Glittering Plain (written and published by Morris in 1891), which is possibly the first modern fantasy story to unite the ordinary world with the supernatural. More importantly, by doing so, Morris broke with a tradition in these types of books, in that they were previously based in real worlds and time periods. Morris was one of the first writers to have his novels take place entirely in a land of fantasy. Among his many inspirations in poetry, prose and subject matter alike, Tolkien cites the work of William Morris. It was some of these works from which Tolkien took hints for names like "Dead Marshes" and "Mirkwood." Tolkien particularly cites The Well at the World's End (sounds like the name of a module, doesn't it? ), written and published by Morris in 1896. If you're not familiar with this part, you've either been living in a cave under the Misty Mountains or you never venture further than the edge of your shire. And this is the part where everybody else comes in. ...as a general rule, the more factors are explicit (that is, separately represented), the more charts and tables you will have, the more "accurate" your game will be, and the less "playable" it will become. If most factors are implicit, your design will be cleaner, play will be faster... and you will have more of a "game" and less of a "simulation." 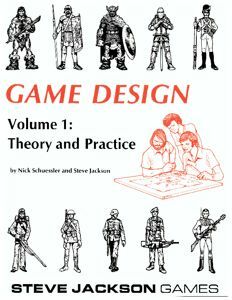 Written in 1981, Schuessler and Jackson's Game Design Volume 1: Theory and Practice was compiled mostly from columns and articles that ran in The Space Gamer from 1980-81 and, as related by Jackson himself in the introduction, looks at game design from both the practical and theoretical sides. As far as the balance between wargaming and role-playing, the bulk of the content is very wargame heavy, with the first 11 chapters covering, among other things, historical backgrounds, mapping and movement, terrain, combat and play sequence and components. Only the 3-pages of chapter 12 (out of the book's total 46 pages + ads in the 1st edition) are solely focused on RPG design. 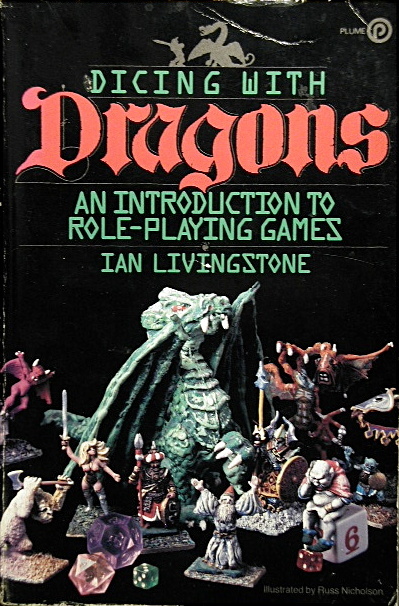 Truthfully, though, less than a decade into the life of RPGs as we know them, many of the role-playing games at the time were obviously founded in the industry's wargames roots, so no faults to mssrs. Schuessler and Jackson. 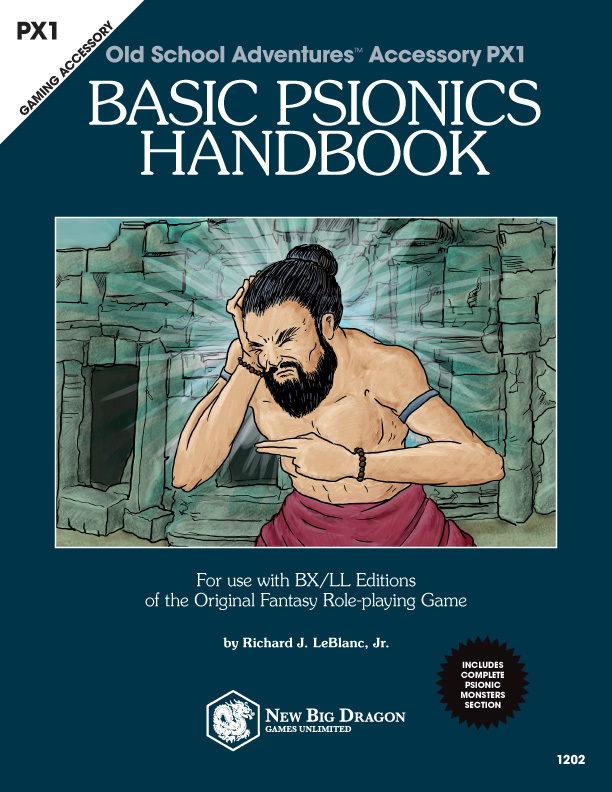 In 1981/2 when I was getting into D&D, I bought both the BX boxed sets, as well as the AD&D PH, DMG and MM. But when I DM'ed, I usually DM'ed BX for two reasons: 1) it was simpler for my friends and family to "get" (my sister loved playing elves as a class), and 2) it was simpler for me to run. Now, had I bought the AD&D GM screen and stopped needing to flip through the DM guide constantly, maybe this would have been different. I remember specifically running module U1 under BX, rather than 1E as was intended. In looking back, I think part of the reason I started to fall away from D&D and started "falling into" games like Marvel Superheroes is because I felt like D&D was getting too "burdensome." I started to feel that way about almost every RPG coming out at the time. There were too many rules. And the books were getting thicker! And there were so many volumes and world books! (To this day, I have an aversion to almost every Palladium book I've ever seen for this very reason!) More importantly, it's why I've been so enamored by and overjoyed with the OSR. In my day, we didn't have 400-page sourcebooks for every freakin' character sub-class... AND WE LIKED IT! 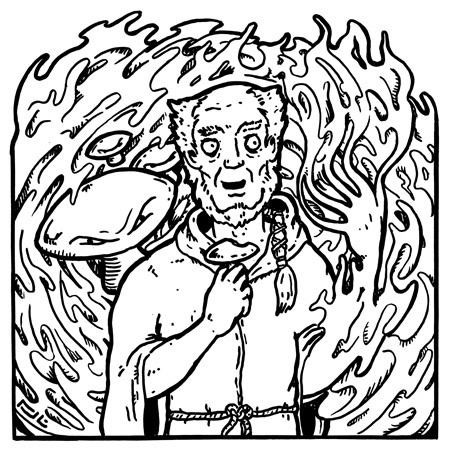 BTW, the illustration is a "a wasted druid hooked on psionic mushrooms." d30-based RPG Update! (or "Some Old-school Love for the King of Polyhedrals") and "The Nice Price!" Okay... I know that's a lot to absorb in one blog post title, but I've got a lot to cover, so let's get to it! So for any of you who read my post on Friday, you know that I mentioned making a great leap forward on my d30-based RPG. I'd been toying around with a form of that mechanic in furtherance of the idea that most pulp heroes are just that... heroes, able to quickly vanquish hirelings and henchmen, and performing most tasks with larger than life artistry and aptitude. 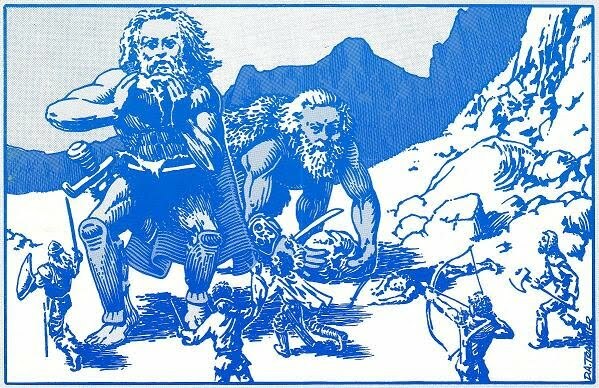 As part of another blog post, I was working on a set of 1E-inspired tables to create "Mutant Humanoids" (hawkmen, crocodile-men, rat-men, et al.) akin to that beloved Saturday-morning cartoon of "savagery, super-science, and sorcery." 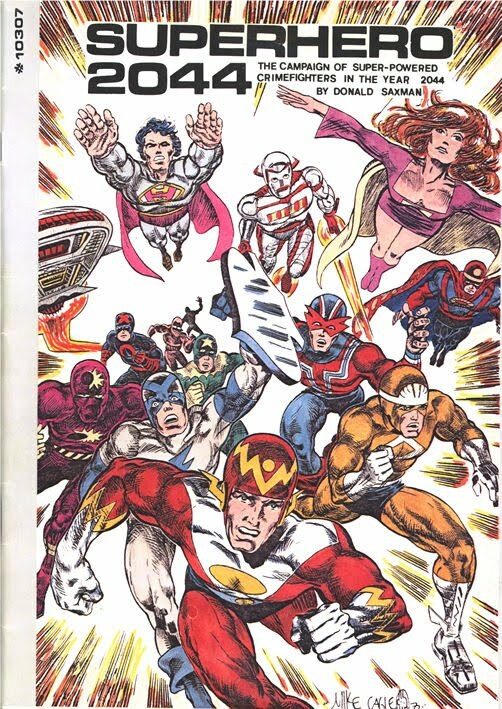 Now... combine those two thoughts (a d30-based pulp RPG and an OSR approach to that Saturday morning cartoon), and you get "Magic, Men, Mutants & Machines: The d30 RPG of the Mutant Fantasy Future." *On a side note, my co-conspirator David Welborn has been leading the charge on playtesting the Starmasters character and combat rules and it seems to be coming along nicely. And finally, THE NICE PRICE!!! "The statue stands about twelve feet tall and features what appears as a bipedal elephant with bat wings, an eye on the end of its trunk, a pair of tentacles in place of each of its tusks, and human hands with long claws. It is a truly disturbing vision." The 1st ed. of Mechanoid Invasion (below, Palladium's first real RPG) is also a little hard to come by, but the collected Mechanoid Invasion Trilogy is fairly readily available. As for Omnigon, it's not terribly obscure, but not widely known. Honestly, if it weren't for games like Spawn of Fashan and World of Synnibar being so widely known for being so bad, Omnigon might be better known. This week's d30 Feature was inspired by a combination of the Marvel Superheroes Universal Table and the Fudge adjective scale. A few days ago when I was prepping this chart/post, the scope of this chart seemed rather limited in that it only represents the effect result (e.g., damage, distance, etc.) as determined normally by a roll of 1d6. It does, however, provide a curved result product based on the "potency/effectiveness" of the acting character and the "resistance" level of the opponent by providing higher results against weaker characters, and lower results against stronger characters (reducing the active character's "effectiveness.") For example, a Legendary (rank: 14) character would normally score 6 pts. out of 6 possible pts. 65+% of the time (on a normal d30 roll on his Legendary "row.") However, a Legendary character has an effective ranking of Feeble (rank: 1) against a Masterful (rank: 13) character, allowing the Legendary character no more than 1 pt. of effect (instead of 6,) and only about 10% of the time. The more important thing here, however, is that this mechanic inspired me toward making a great leap forward with my d30 Pulp RPG project! Unfortunately, you'll have to wait for Monday's post to get an update on that. 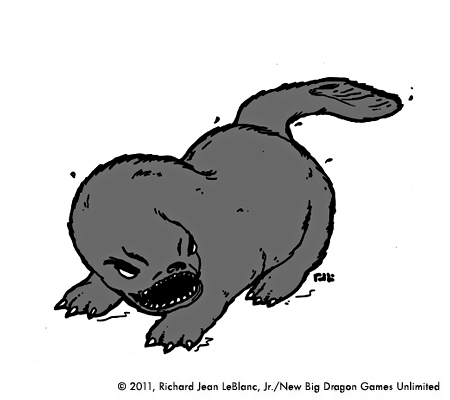 These nasty creatures often described as "part dog and part fish," dobharchú are actually more akin to dogs and otters rather than fish, and range in color from dark brown to black. In fact, while swimming, they are often mistaken for standard otters, but are far from it, having the strength and ferocity of a much larger animal, and the speed and temperament of wolverines, only faster and more temperamental. If discovered in their lair, there will usually be 3-5 dobharchú -- 2 adults, and 1-3 pups/young (40-60% grown.) If a human intruder is present, all will attack. If no human intruder is present, only the adults will attack, but the young will defend themselves. all from Indian Fairy Tales published in 1892 (and, no, that's not a typo of "1982."). A couple of weeks ago, I posted an old map I'd found that I did in high school in the 80s for a Wizard's Keep. 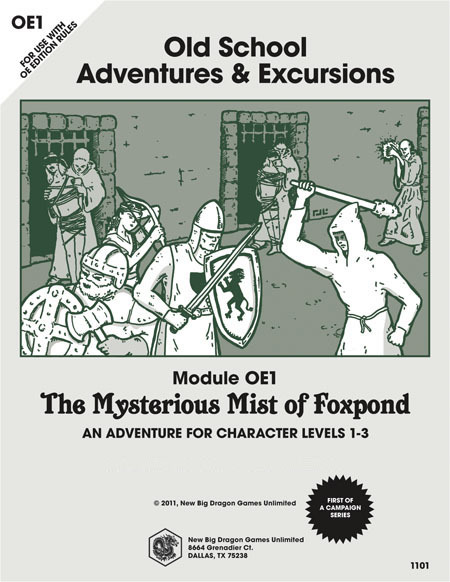 Inspired by that map, as well as the Undertemple map I posted the week before, I decided to write an OE module around them called "The Mysterious Mist of Foxpond." That's where the various new OE/1E monsters have been coming from, including the guardian bramble, canine flesh golem, and (the most recent) stone skeleton. The maps themselves have been cleaned up and altered slightly (an understatement on the undertemple - which looks completely unrecognizable now.) It includes 4 new monsters (the 3 noted above, plus another) and 12 pre-generated characters. More importantly, it's a "thinking" dungeon (more along the lines of Tomb of Horrors rather than Keep on the Borderlands.) I'm working on all the illustrations now and should have a playtest copy ready in the next couple of weeks. 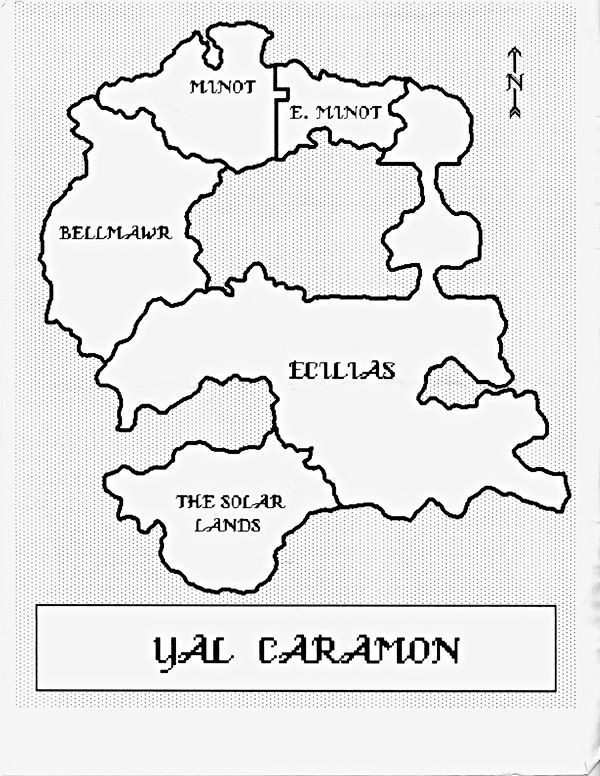 From the title page: "Something dark and sinister is going on in the area of Fairmoor. A strange mist is descending upon Lightwick Haven and stealing away into the night with the young and innocent women of the village. Rumors are beginning to circulate that an ancient cult, thought to have been long absent, has returned with its sights set upon the destruction of the world. This strange force, whatever it is, must be stopped, and an end put to the nightmarish reign." Stone skeletons appear as standard skeletons and are animated in the standard fashion, but the bones of the corpse have fossilized. This fossilization of their bones gives stone skeletons a slightly higher armor class and and a bonus to their hit dice over standard skeletons, but it also makes them slightly slower. As per normal skeletons, stone skeletons are undead and, therefore, immune to sleep, charm and mind reading spells, and can be turned by a good cleric. Similar to golems, their commands can be suspended and "triggered." The old chart has some obvious shortcomings. First, the attacker's height roll adjustments should probably be broken into more than 1' increments. Second, it only accounts for a target of average adult human height. 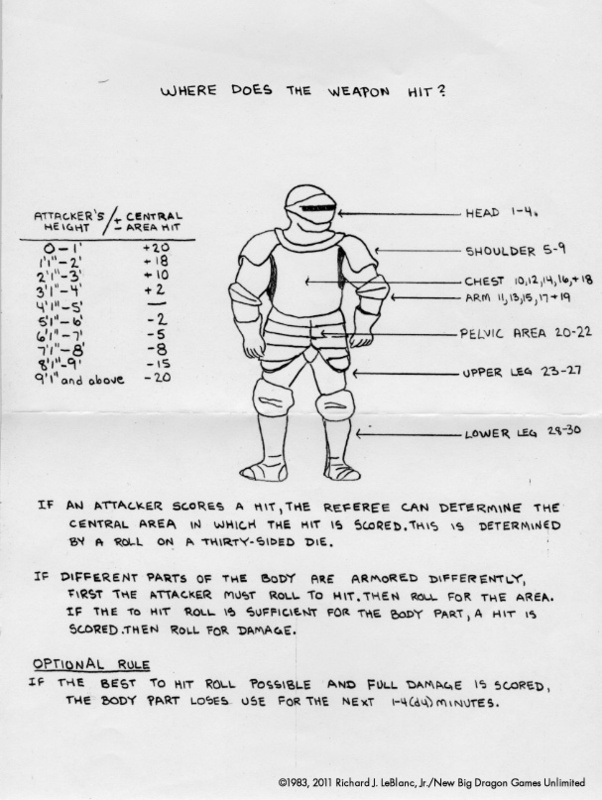 Third, the 2nd direction should probably read, "If different parts of the body are armored differently, the attacker should roll for hit area first, then roll 'to hit' based on the AC of the target area, then roll for damage if a successful 'to hit' roll is made." And fourth, I should have probably added rules (based on damage per body part) for losing use of the part altogether vs. 1d4 minutes. But, all-in-all, I wouldn't say it's too shabby for a ninth grader who didn't even have his learner's permit yet. I can sum up everything Stan Lee knows about drawing comics books in seven words - "Hire great artists. Keep all the cash." It's as simple as that. To download a free PDF from MediaFire, click here. 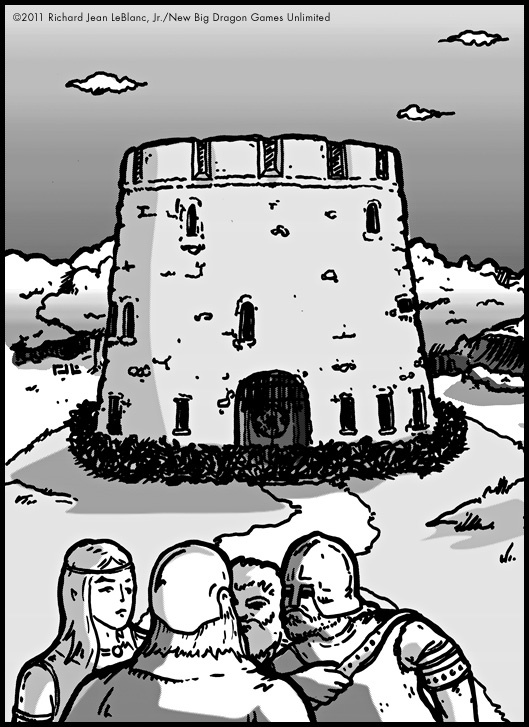 Today's Discovered Dungeon is again, not a dungeon, in that it's a castle, and not so much discovered (per the first two posts in this series) as it is "interpreted." 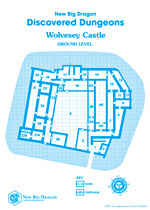 It's my interpretation of the ground floor of the caslte, based on the actual ruins of Wolvesey Castle near Winchester Cathedral in the UK, and the scale of the drawing should reflect the dimensions of the actual castle (where 1 square = 10'.) I'm planning to finish this out at some point with a parapet level, as well as an in-ground level, and below ground (i.e. "dungeon") level, the latter two of which will be completely invented. To download a free PDF of this map from MediaFire, click here. Okay, before you read any further, any guesses as to who did this illustration? 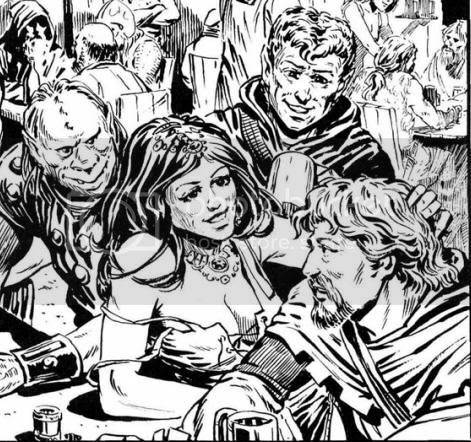 It does have that Larry Elmore juno se qua, doesn't it? Well, it's not Larry's. The old school artist who did this illustration of the fairy tale "The Wooing of Olwen" is John D. Batten. He was born in 1860 and died in 1932. That makes him a REALLY old school artist. I discovered Batten's work while trolling Wikimedia Commons searching for images for The System earlier this year. 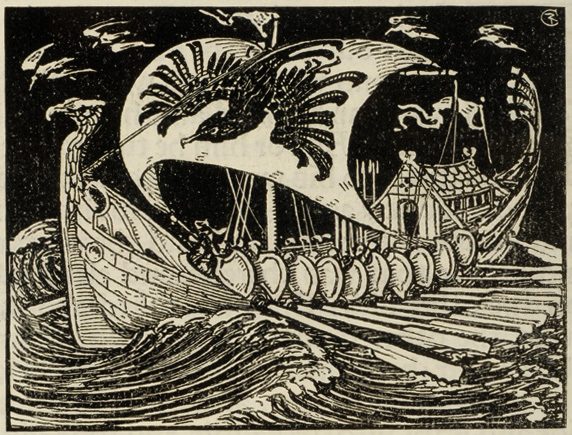 This image is from The Book of Wonder Voyages, a volume by Jason Jacobs, a collection of English, Celtic, Indian, and other European fairy and folk tales. Just look at this baby... it could have been an OD&D module cover alongside the original 2-color Tomb of Horrors, or the early G Modules. 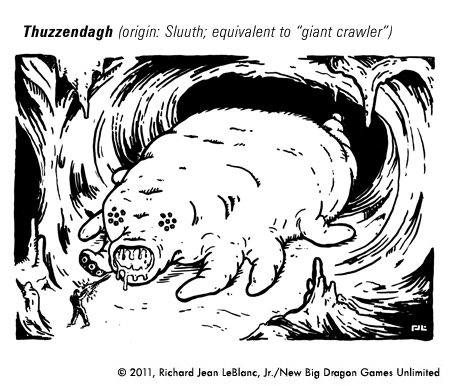 This one is another one from The Book of Wonder Voyages, and looks like it's straight out of the 1e AD&D Monster Manual. You can probably see why I relied so heavily on so many images from Batten when I put together The System. It was a way of inexpensively achieving an old-school illustration look by going really old school. 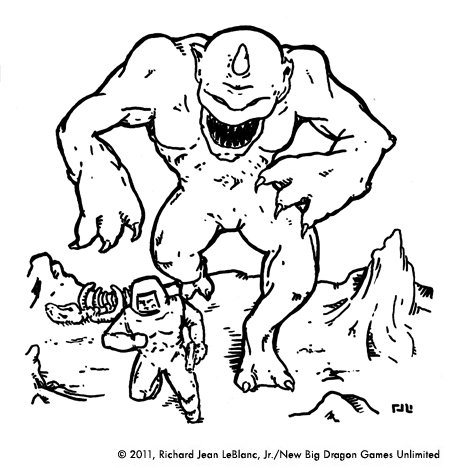 These are actually creatures from the Starmasters old-school sci-fi game I'm working on, but I'm considering adding OD&D/1e stats for them and posting those in the next couple of days. 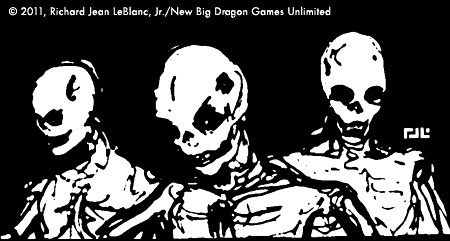 Both images ©2011, Richard Jean LeBlanc, Jr./New Big Dragon Games Unlimited. The reproduction or re-purposing of these images is strictly forbidden except by direct permission by the copyright holder. These images are NOT CREATIVE COMMONS!